Harry Styles - Sydney November 26th 2017 - Concert Review - SY Music - Music Lessons. Consulting. Music Production. 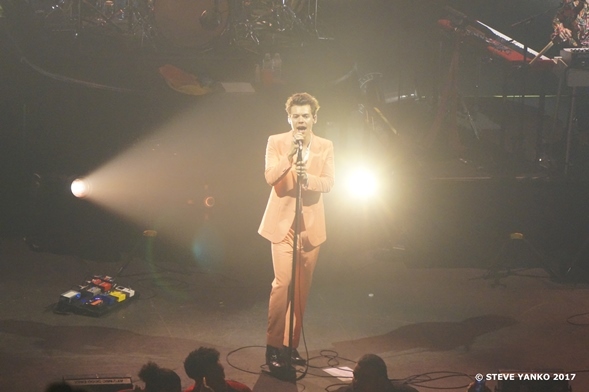 I’ve just seen Harry Styles’ 1st solo show in Australia at the Enmore Theatre in Sydney and I’m very satisfied and feeling positive after watching a great show. As a songwriter and musician, I’m not interested in Harry Styles movie star good looks but I’m interested in his music. I’ve even seen him perform with One Direction back in 2015 (see review). Thankfully his 1st solo self-titled album is a fantastic piece if work. The songs on the album are melodic, dynamic, thoughtful and very well produced. The 1960s and 1970s influenced music and Harry Styles’ modern pop vocal style work beautifully together. With that in mind I was curious to see how Harry Styles would perform these great songs live. Harry Styles performing at his 1st solo show in Australia. So as to not spoil the show for those going to his upcoming shows I won’t go into detail about the gig. However I will say I was very impressed. The songs chosen for the show and the set list order was very good and gave the show a dynamic edge. 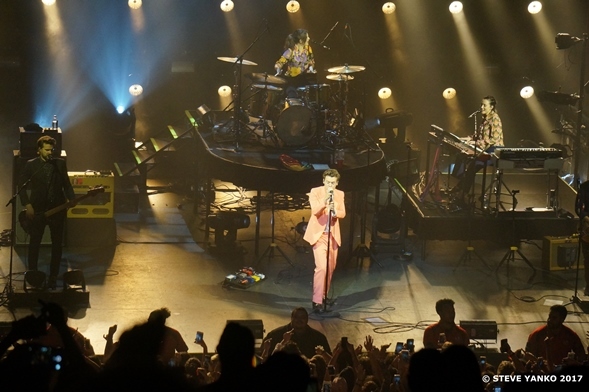 The band comprised of drums, keyboards, bass guitar, lead guitar and Harry Styles played rhythm guitar in many of the songs. 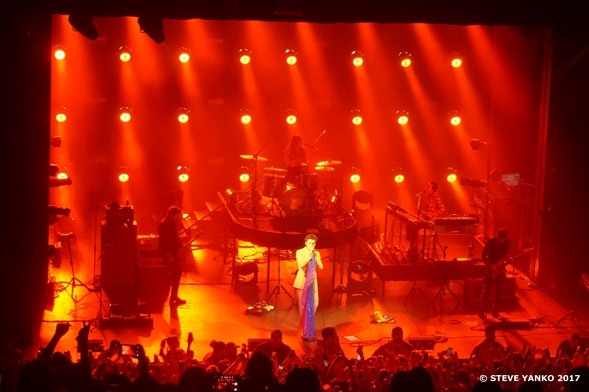 The sound was excellent but at times the lighting behind Harry Styles facing the audience made it difficult to see him. Nevertheless the staging was very good as all members of the audience got a good view of the performers on the stage. Harry Styles & his talented band. 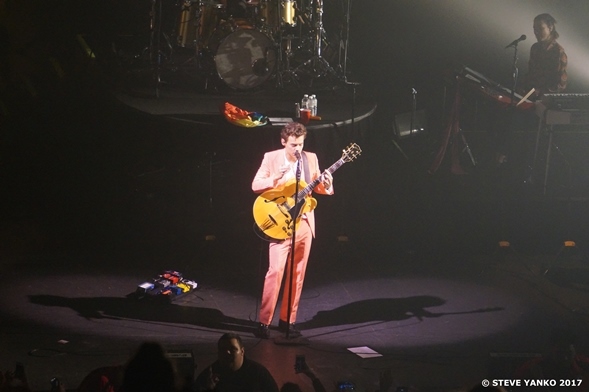 Dressed in a pink suit, Harry Styles commanded the audience’s attention from start to finish. Harry Styles is a very good live performer. His years in One Direction have taught him how use all parts of the stage and he did this very well throughout this show. Harry Styles played rhythm guitar in many songs in his concert. When he spoke to his fans he was very warm and sincere. He was genuinely concerned for the audience members who appeared stressed in the sea of bodies pressed against each other at the front of the stage. Harry Styles’ vocals were strong and he sang his songs with passion and authenticity. As a fan of his music I really enjoyed the performance of his new songs such as ‘Two Ghosts’, ‘Carolina’ and ‘Kiwi’. However I really loved the new arrangement of One Direction’s ‘What Makes You Beautiful’. I also enjoyed how he introduced his band members and then sang Fleetwood Mac’s ‘The Chain’ complete with perfect harmonies. 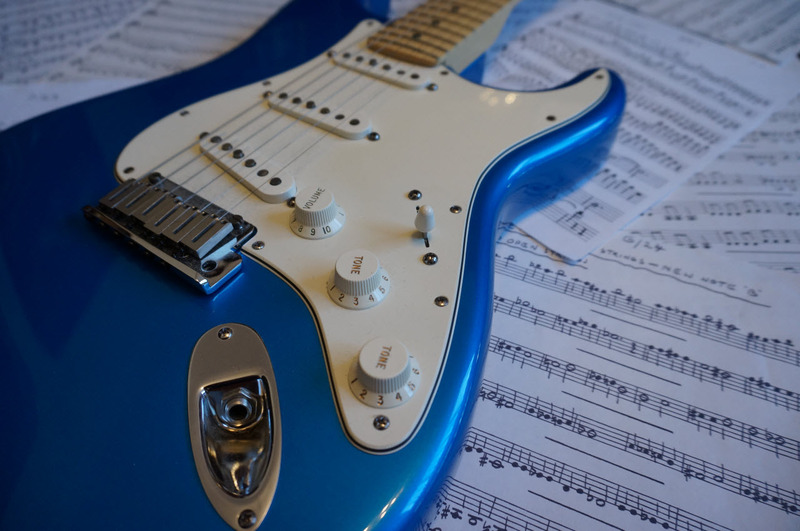 Like Elton John has ‘Your Song’, Billy Joel has ‘Piano Man’, George Michael had ‘Careless Whisper’ and Prince had ‘Purple Rain’, Harry Styles has the superb ‘Sign Of The Times’. It is a brilliant song and Harry Styles’ performance on Sunday night was emotionally powerful and breathtaking. It is the song that Harry Styles will always have to perform at his concerts. As I left the Enmore Theatre, I could see thousands of happy faces of mainly teenage girls. Across the street, I could see the parents waiting to take their children home. This got me thinking. Will these girls continue to support Harry Styles as they get older? I think all the signs are good. Forget about his charisma and good looks. Simply, if Harry Styles continues to write and perform great songs, does not act like an obnoxious and jaded brat then I believe his fan base will be loyal and will continue to grow. 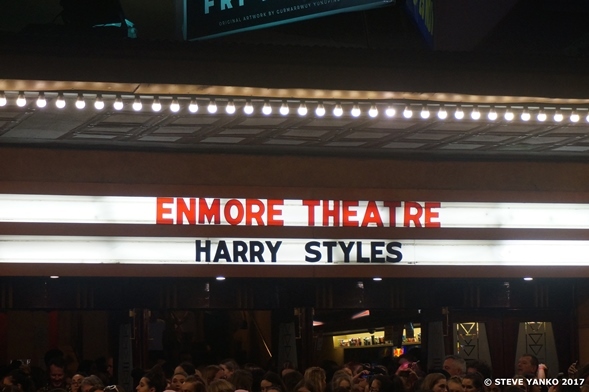 Harry Styles at Sydney’s Enmore Theatre. As crazy as this sounds, I don’t think Harry Styles has fulfilled his potential even though I think his 1st solo album is excellent and as a live performer Harry Styles is great. I firmly believe he will continue to develop as an artist and therefore it’s exciting to see what he does next musically. For those people going to his concerts, you will not be disappointed. It’s always a pleasure to see young musicians playing real music that has a positive impact on people’s lives. I really enjoyed the Harry Styles gig and I’m looking forward to hearing new music from this artist. PS. In case you were thinking about it….Yes I travelled from Melbourne to Sydney to see this gig.